New Yorkers like to make fun of LA’s subway. Angelenos like to make fun of how New York is a raging hellhole of gentrification that reeks of desperation and greed—but with great trains! So with their baseball teams meeting in the playoffs, it’s only natural that their transit systems start talking smack. OH SNAP. After that the conversation started to go off the rails a bit, with LA dropping a kind of lame GIF and then NYC asking what kind of food that LA should wager, which I assume means that NYC agreed that its most valuable foodstuff is a slice of pizza that’s been dragged through the streets of Manhattan by a rodent. 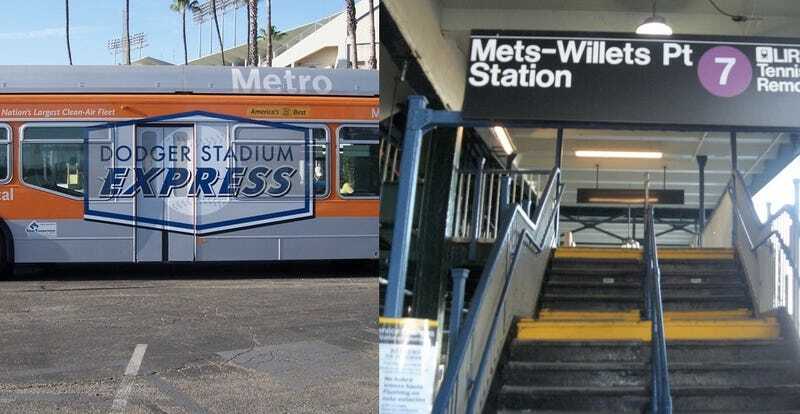 The Dodgers are clearly going to win the playoffs, so let’s talk about who wins transit-accessible baseball. The 7 train does go directly Citi Field. The fact that a rail line doesn’t go directly into Dodger Stadium’s parking lot is kind of a touchy subject here, although it’s only a 20-minute walk from the nearest light-rail station. However, the stadium offers a free shuttle on city buses from downtown that drops fans right at the stadium. Free! LA all the way. The great irony in all this, of course, is that LA’s Dodgers were originally the Brooklyn Dodgers, who were named for the “dodging” required around NYC’s notoriously deadly streetcars. So, if you think about it, LA’s Metro and NYC’s MTA are technically on the same team, promoting safer, more accessible transportation in our cities. Besides, does it really matter who wins as long as everyone takes transit to the game? It actually does matter, because the Dodgers will win.